The Queen's Head is coming to Queen Street in Peterborough. Fans of homecooked comfort food and beer from around the world are in for a treat as award-winning pub chain, Pizza, Pots and Pints, opens the Queen’s Head on Queen Street in Peterborough city centre next month. The concept is based around the idea of the perfect place to enjoy a pint with friends and the food that would be an ideal accompaniment. Everything about Pizza, Pots and Pints, from its light crispy artisan pizza cooked in a bespoke wood-fired oven, to warming one-pots of comfort food such as bubbling mac and cheese, to delicious beers from around the world, is an obsession for those who run the business. The opening team in Peterborough will consist of Sam Adams, a huge beer fan, and Craig Billington, a foodie perfectionist. They’ve been with the company from the start and have taken the Pizza, Pots and Pints idea and run with it, making sure the homemade food served alongside beers from around the world perfectly matches the passionate and quirky atmosphere. 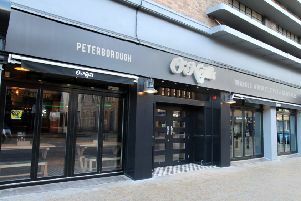 This is the third Pizza, Pots and Pints to open (the others are in Cambridge and Baldock) but the first city centre site for the chain, as Director Craig Mayes explains: “We’re really excited to share our passion of delicious Pizza, Pots and Pints with the people of Peterborough. “Sam and Craig are a perfect pair and have made our pioneering Cambridge and Baldock venues a firm favourite with locals there. We’re sure Peterborough’s foodies and beer fans alike will also delight in what they are bringing to the city. If you share the same passion for homemade food and beer, you can also play a part in the Queen’s Head’s success. Sam and Craig are looking for full and part-time staff in all areas of the business, so call the pub’s recruitment hotline, on 07866 934462 if you’re keen to be a part of the team.